A mad scientist's lab? Nice! Looks awesome. Not sure if I'll be done in time for Halloween, but we'll see. I'm kinda working on something, no idea if I will finish in time or if it's even going somewhere. So cool, Mo man! Looks sci-fi horror. That looks awesome prpl. I love how their eyes glows in the darkness. That is pretty awesome Purps! Alas I need my line open and can't post my new screens. Will say I need to use the old fashioned encounter system cause a TES would take too much time to code in. Got two battle charas to do yet and I still need to make a custom title screen and better restart room. 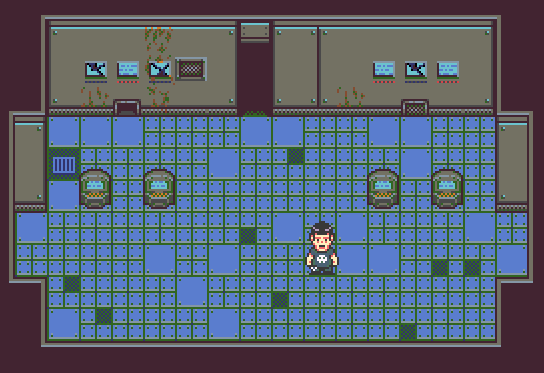 Also the rooms will each have a boss at the end and by defeating them you'll unlock your party. Coding in a shop still and still using the Alpha Force-like skills over weapon system. Though I am only going to use a few custum animations Mostly going to copy and paste animations from Wrath of Gaia, Carpe Diem and Misadventures to save time. Oh and best part? about four maps left and I'm done with all mapping. Sounds cool, post some screens Fish. And an update: Got all but four or five rooms filled with events, but man...These battle sets. > > If somebody could do me a favor and finish out the last two? It'd be a real big help. Technically two and half. I started on the first part of the third character and got two or three poses done. Doesn't need to be perfect but PM me if your interested. Can't post anything here cause I still would like it to be a surprise for the player. Take out the fog IMO. Custom fog looks much better and takes hardly any more effort. Hmm really now? Hmm I'll have to try that thanks, Meis! Come on guys. Only a short time till all Hollows Eve is upon us. Where's dem games? Looking good guys. Halloween is coming Friday, but Momeka didn't give a deadline for this, so it's more meant as: create a game, with Halloween in mind, somewhere near Halloween, but not precisely on.